Coughwort, assfoot, horsefoot, foalfoot, bull's-foot, horsehoof, colt-herb, clayweed, cleats, dove-dock, dummyweed, ginger, gingerroot, hoofs, sowfoot, British tobacco, gowan. Coltsfoot is found along brooks and in wet places and moist clayey soil along roadsides from eastern Quebec to Pennsylvania, Ohio, and Minnesota. The white woolly, scaly flowering stalks of this plant with their yellow blossoms appear in the spring before the leaves. 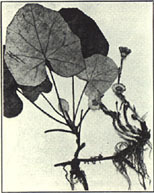 There are several stalks, from 3 to 18 inches in height, arising directly from the rootstock and each one bearing at the top a single yellow flower head having in the center numerous tubular disk flowers which are surrounded by ray flowers. The flowers open only in sunny weather. The ripe seed head looks somewhat like that of a dandelion. Some time after the flowers appear the leaves are produced on long erect stalks directly from the rootstock. They are from 3 to 7 inches wide and in shape resemble a horse's hoof. The lower surface is white with densely matted woolly hairs. The leaves and roots, the former collected when they are nearly full size. prev: Cohosh Bugbane. Cimicifuga racemosa (L.) Nutt. next: Comfrey. Symphytum officinale L.